The tsunami that blighted Thailand, Indonesia, Sri Lanka and India on Boxing Day of 2004 is a natural disaster on a virtually inconceivable scale. Triggered by the third biggest earthquake ever recorded, fourteen countries saw casualties exceeding a quarter of a million. Juan Antonio Bayona is the first director to tackle this staggeringly appalling event cinematically and chooses to concentrate on one family’s story. It’s a shrewd move as perhaps the only effective way to coherently navigate the chaos of such an epic tragedy. Based on true experiences of the Belon family (here renamed Bennett for the western market), we begin with Naomi Watts, Ewan McGregor and their three young sons excitedly arriving at a Thai holiday letting in an idyllic Palm tree-lined resort. There is very little calm before the storm. They eagerly explore their bucolic beach-house. Christmas presents are opened. And they are soon sunbathing and splashing in the pool, a paradise tarnished only by a brief reference to the work stresses the parents are aiming to escape from. Of course there is little point dwelling on this preface. Aware of the terrible events about to unfold we, the audience, are uncomfortable eavesdroppers onto conversations that are, as a result, distant, stilted …irrelevant. Preceded by only a brief distant rumble and the sudden fleeing of birds as warning, the wave hits, in a set piece charged with communicating a terror difficult to comprehend. The realisation of these key scenes is the film’s chief success. Avoiding the overblown histrionics of a Hollywood genre piece, any CGI is underplayed, subtly weaved into an impressively pragmatic declaration of real-life horror. We are as immersed as the protagonists as the water swallows all in its path, taking us into a disturbingly abstract realm, a bewildering perspective that is key to securing our identification with the victims. And as the family is separated by the havoc, their characters are revealed. Tom Holland, as eldest son Lucas, is the child forced to become a man the instant the tragedy strikes. He grapples with the recognition that the tables have turned and now he carries responsibility for his mother’s survival. In the immediate aftermath we follow the stricken pair’s shock, disorientation, despair, and Watts’ numb stoicism in the face of an unimagined terror is especially convincing. 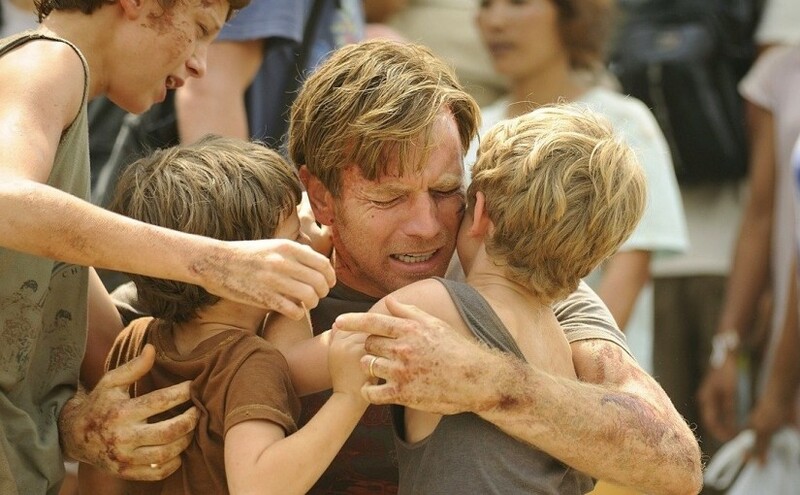 Ewan McGregor’s performance is largely one of steely restraint, of grim determination to keep himself together for the sake of his family. But his standout moment comes when this inevitably cracks. At last able to make (all too brief) phone contact with home he finally breaks down. The trigger of his father-in-law’s incomprehension is barely audible on the line, its British reserve powerfully incongruous against a setting awash with raw emotion. It is an instant of intimate impact amid a series of remarkable scenes in terms of scale and accomplishment. As well as those nightmarish underwater sweeps, tracking shots within the deluged hospitals merely glimpse the extent of the tragedy in passing rather than mawkishly dwelling upon it. We are following one ordinary family’s tale of submersion in an extraordinary disaster, foisted upon them within the blink of an eye, and it is just one story within a myriad. Without requirement of gore or sensationalism, told from a pedestrian viewpoint, this is hard-hitting stuff. It is never made clear what The Impossible of the title actually refers to. Within the realms of such an apocalyptic event, it could just as equally signify the chances of the family’s reunion or survival. Or indeed the likelihood of such a desperately cruel manifestation of nature’s indifference happening at all.